We are scheduled to participate in three panels at Comic Fest this weekend with X-MEN:TAS director-producer Larry Houston. It will be our third appearance there, and we wanted to give you a sense of why we continue to go back. While WonderCon last month was exciting in its size and scope (70,000 people, 1700 at our X-MEN:TAS panel), Comic Fest is low-key. It’s like visiting a favorite small town instead of a big city. While the biggest Cons have expanded into every corner of popular culture, Comic Fest remains comics-focused. The people are very comics-knowledgeable. We meet friends from way back. (Scott Shaw, who designed the Fest poster below was my office-mate at Hanna-Barbera in 1986.) The location is like a vacation spot, not a trade show. And the founders go back to the beginning of the Con movement, so they choose guests wisely. So join us if you can — we’ll have a signing table and stacks of books. See you there. Julia here – Eric is the one who usually writes these posts (I’m the one handling our Twitter feed) . 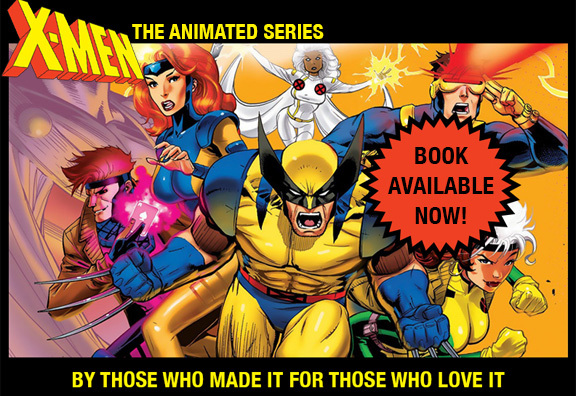 To all members of the WorldCon 76 (San Jose) — Please consider submitting “Previously on X-Men: The Making of an Animated Series” for a Hugo nomination in the Best Related Work category. I just checked on three AMAZON sites: US, Canada, and Germany. The book is available on all of them!! As I understand it, that means that the full-sized SOFTCOVER is available immediately, printed by Amazon anywhere there is an Amazon, in local currency, at a reasonable price. The hardcover is still a problem for buyers outside of the US because of shipping costs. The book is heavy (a kilo). I sent a copy to a friend in New Zealand, and it cost me $42 just for shipping. The publisher WILL send signed hardbound copies, bought through their store, worldwide — but they charge $50 packaging and shipping outside the US. Julia and I had an alternative for people outside the US who can’t afford that huge shipping cost to get a signed copy. If you buy the book in your country, simply send us a picture of you holding the book (send to: xmentas92@gmail.com), and I’ll print and sign the picture and scan and email it back to you. Best, ERIC.